Being a part of the dating scene these days includes a lot of swipes, coffee dates, drinks, laughs, great connections, and even some bad dates. 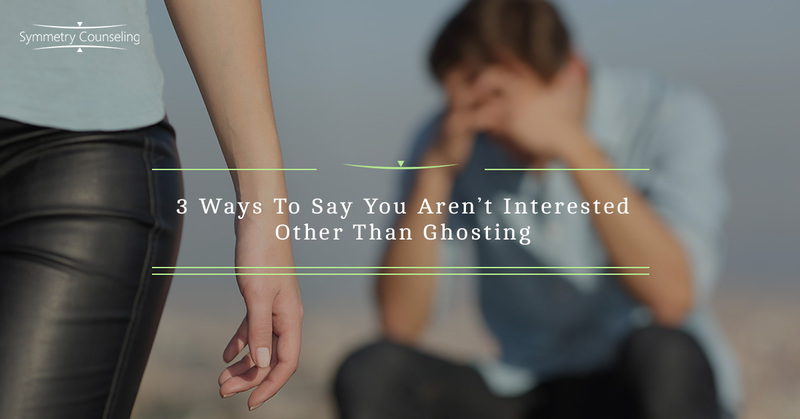 The easy and very common way to let someone know you aren’t interested is to “ghost” them. Ghosting someone entails ceasing all communication and contact with them without warning or explanation. To be honest, most of you have probably thought about ghosting someone at some point because, like I said, it is easy. It is easier to not have to confront them and face their potential hurt or disappointment. Just because it is easy though doesn’t mean it is the most effective or kindest way to communicate that you aren’t interested. Ghosting creates a lot of anxiety, insecurity, and sadness for the other person involved — you just don’t have to see it. Below are a few better ways to communicate to someone that you are not interested without hurting them by ghosting. The number-one thing that comes up when the topic of dating and ghosting come up is how blindsided the person that got ghosted feels. They thought the person was interested based on how they acted on the date, what they said during the date, and any follow up texts or messages of interest they received after the date. If you know you are not feeling a strong connection on the first date, it is important to try not to lead the person on. Use your body language and communication to reflect how you truly feel without being rude. For example, if you know you don’t want a second date, don’t say “we should do this again” or lean in for a kiss at the end of the night. Simply practice being a little more transparent on your dates rather than showing interest that isn’t there. Regardless of the signals given on the date or how many dates you have been on, if you aren’t feeling the connection, it is crucial it is communicated. Whether you send a text or schedule a time to meet up, it is best to let them know how you feel. A text saying, “Hey, I had a great time getting to know you, but I don’t think the connection is there” is better than being left in the dark. The other person may have a few questions regarding why or what they did wrong. It is normal for them to feel this way, so simply validate how they feel and answer their questions as best you can without letting them change your mind. At the end of it all, the relationship will end with dignity rather than with guilt. When you choose to communicate with them, it is important you keep their feelings in mind and be honest about why you aren’t interested. Some common lines people use are that they “aren’t ready for a relationship at this time,” “have a lot going on,” or “don’t have time for a relationship.” If this is true, that is fair, but if it isn’t, then be honest. If you have met someone else or aren’t interested, let them know. For example, you may say, “I felt a very strong connection with you but I have to be honest and tell you I have met someone else that I feel strongly for.” Keeping the other person’s feelings in mind and respecting them enough to be honest is admirable. Ending on a bad note is never fun for anyone, even the ghoster, so be honest and respectful and it will end on a better note. If you are finding it difficult to communicate your lack of interest to those you date or if you feel you are getting hurt by ghosting and would like some support, it may be useful to connect with a therapist. Contact Symmetry Counseling at 312-578-9990 to set up an appointment with one of our very skilled therapists today!